3 ensuite AC bedrooms, 4 full bathrooms, sleeps up to 6 persons. 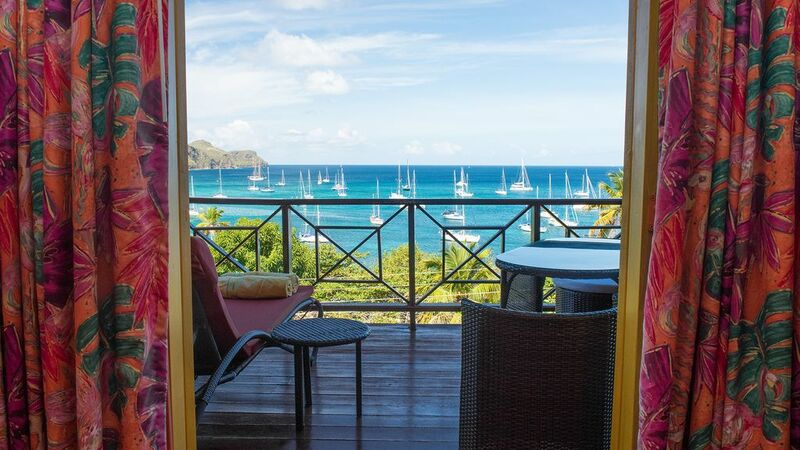 For the perfect Grenadine island escape, Flamingo villa, is a fabulous Bequia rental situated on Princess Margeret beach, 1 of Bequia's most beautiful white sand beaches. It is tucked away & surrounded by lush tropical gardens & fruit trees w/a wonderful private pool area, barbecue & gazebo where you can laze around & watch some spectacular sunsets, full moons & falling stars. This villa is perfect for romantic getaways, weddings, honeymoons, fun-filled family vacations, getaway with friends & executive retreats. With our dedicated & friendly staff that have been serving our guests for over 10 years, we offer complimentary daily housekeeping service. This location is most central to everything yet set apart amidst a tropical paradise of privacy. The main town, Port Elizabeth is a short water taxi or drive away or a cool 20 min. walk away where restaurants, shops & ferry service are located. The airport is a 20 minute drive away. About us: Flamingo villa has been in service for over 12 years. This unique beachfront villa is continuously upgraded & well maintained so that guests always feel a freshness & comfort at all times. What makes us even more special & memorable is our team of staff who have over 10 years of service & who make all the difference to a fabulous, enjoyable, relaxing & stress free vacation. This is also reflected in our numerous repeat guests over the years. Tucked away in comfortable & relaxed setting: Flamingo is a colorful beachfront villa with some lovely warm wood finishes located right on Princess Margeret beach yet tucked away among lush foliage & fruit trees & surrounded by the vibrant colors of the Caribbean. Overlooking the crystal clear waters of Princess Margeret beach, this villa offers comfortable accommodation with stunning views from every angle imaginable! Just sit on any patio & watch the ferries & yachts roll into & out of admiralty Bay harbour on any given day. The beach offers the most amazing sea bathing for children & adults & there are 2 snorkeling areas at either end of the beach. This tropical hideaway is fully equipped with all modern conveniences. You're within walking distance of Lower Bay where there are some tasty restaurants while Port Elizabeth is a 5 minute water taxi or drive away. There are some really nice trails in either direction where you'll enjoy seeing some of the other Grenadine islands in the distance. Flamingo & Villa has 3 en suite bathrooms, all a good size with funky decor, adequate towel racks, hairdryers & shaving outlets plus one additional full bathroom which guests can use. Baby sitting service is available from in house staff. Meal preparation service is available from housekeeper. Complimentary daily housekeeping service available. laundry available through housekeeper only. Cell phones available. Dual voltage available: 110 & 220 volts. My husband and I stayed at Flamingo Villa for our honeymoon and we couldn't have been happier. We did not want to leave! Waking up every morning to unreal views of the bay and the boats docked was magical and the house itself is the perfect tropical getaway, making you feel like you are the only ones on the island! Being steps away from Princess Margaret Beach (the best on the island) was excellent. We spent most of our days there and it was easy to pop back up to the house for whatever we needed. The pool and amenities at the house itself were great as well - fully stocked kitchen, bbq, loungers, A/C in bedrooms. And Carmina, the property's housekeeper was super sweet and helpful. It was perfect! Thanks to Nina and the Property Management for a wonderful stay. It’s a home away from home in an island paradise! Flamingo is the perfect spot to take a little break. Lovely and idyllic spot. Home is bright and beautiful.. with breath taking views.. so from coffee in the morning til wine at sunset totally relaxing. Service was first class...accomodation was so comfortable. Once of the most amazing vacations EVER!!!! Flamingo Villas is simply stunning!! The location on princess margaret beach, the decor and overall ambiance couldn't be any more perfect. This is definitely a must if you're planning on visiting Bequia. We were a group of 6, including 2 children, and we stayed at this wonderful place over the first two weeks in April 2017. The villa, views, surroundings and pool are even more beautiful than we expected. The villa was very clean and the housekeepers, Josephine and Carmina, are an absolute delight and looked after us very well. The bedrooms all have efficient ceiling fans / AC, the beds are comfortable and the views are all out to sea. We loved sitting on the verandas watching the sailing boats come and go, and the sunsets were absolutely stunning. Within a few steps from Flamingo villa is Princess Margaret beach, which is one of the best beaches we have ever seen. There is also some good snorkelling at one end of the bay and Jack's Bar on the other provides high quality snacks, drinks and meals. The town and a good choice of other restaurants can be reached via the walkway along the cliff front and taxis are inexpensive, so it is easy to get around. We also had a fantastic sailing trip to the Tobago Cays / Mayreau with Captain African on his well equipped catamaran and we can highly recommend him. We all enjoyed our time at Flamingo Villa and would definitely like to come back again soon! Flamingo villa is located on Princess Margeret Beach, one of the nicest white sand beaches with the most pristine waters on Bequia. This tropical hideaway offers comfortable accommodation with stunning views from every angle imaginable. This villa is a short water taxi or drive away from the busy harbor of Port Elizabeth where there are restaurants of all kinds, groceries, vegetable & fruit market & shops. On either side of Princess Margret beach there is excellent snorkeling. This central location which is also just 15 minutes from the airport,allows for beautiful panoramic walks & hikes in all directions of the island. 25% deposit required to confirm booking. MasterCard, Visa, certified cheque, bank draft accepted. Flamingo requires a minimum stay of 2 weeks over Christmas/New year Eve period only. High season rates from Dec to April as follows: Flamingo: 1 bedroom up to 2 persons: US$ 3,500. per week. 2 bedroom up to 4 persons: US $4,200 per week. 3 bedroom up to 6 persons:US$5,005 per week. Low season April 15 Through Dec 1st rates from US$2,450. per week. A refundable US $200 damage deposit is included in final invoice. Final balance is due 6 weeks prior to arrival date.In event of cancellation, deposit & /or full payment can be reused for alternate booking based on availability. Low season rates as follows: Flamingo: 2 bedroom/up to 4 persons: US $2,940 per week. 3 bedroom/up to 6 persons: US $3,503 per week. All rates include complimentary daily housekeeping service. Same terms & conditions apply to refundable damage deposit & cancellation policy as shown above.